The genus Moeritherium, (from lake Moeris, an ancient egyptian name for the oasis in El Fayum in Egypt, where the first specimen was found 1904 by Charles Andrews, and Therion: greek for animal) has its origins in Miocene, about 50 million years ago. Moeritherium is regarded as ancestor for the mammal order proboscidea, which includes all elephants. Moeritherium was a pig-like animal, about 70 cm high, and resembling the tapirs. 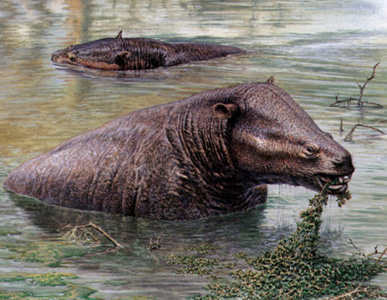 Altough not related with hippos at all, its external body and daily life can be compared with hippos, because Moeritherium was probably semi-aquatic, living in rivers and lakes, and mainly feeding on water plants. The eyes and ears were placed high on the head, always above the surface when swimming, it had no trunk, but its nose was long like a tapirs. Chemical analyses of fossil teeth suggest that Moeritherium spent much of their time In freshwater habitats (Alexander G.S.C. Liu, 2008). Their incissors were very dominant, almost like small tusks, and the second pair of incisors in each jaw were enlarged, as the tusks of the later Tetrabelodon (four-tusked Mastodon). All six nairs of cheek-teeth were in use at once.